Following on the heals of its successful journey across the United States in the Summer of 2013, culminating in a late night arrival at New York’s John F. Kennedy International Airport, Solar Impulse has unveiled the next step in its solar-powered flight mission. Dubbed Solar Impulse 2, the new aircraft is larger, more advanced, and can fly further than its predecessor. 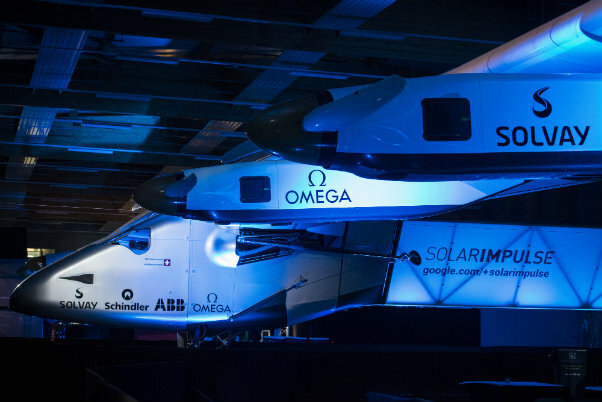 The Solar Impulse team, led by co-founders and pilots Bertrand Piccard and Andre Borschberg, aims to fly the new aircraft around the world in 2015. 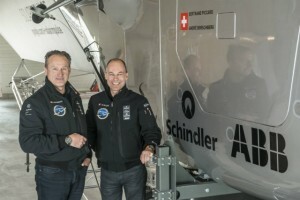 (From left to right) André Borschberg, Co-founder and CEO and Bertrand Piccard, Initiator and Chairman are standing beside the cockpit of Solar Impulse 2, the single seater solar airplane with which they will attempt in 2015 the first round-the-world solar flight. Image courtesy of Solar Impulse. The original Solar Impulse aircraft, bearing the registration HB-SIA, was always intended as a prototype and technology demonstrator. Beginning in 2009, the aircraft flew a series of missions, each with increasing complexity and duration. 2009 saw a series of ground tests, culminating in a brief liftoff and 350 meter flight. In 2010, the team conducted a series of flights. In addition to conquering night flight, no easy task in an airplane powered only by the sun, the aircraft flew across Switzerland in a series of 4 flights connecting the home base in Payerne with Geneva and Zurich. Next came a tour of Europe in 2011. After flying to Brussels, Belgium, the aircraft headed to Paris, where it was the special guest at the Paris Air Show. 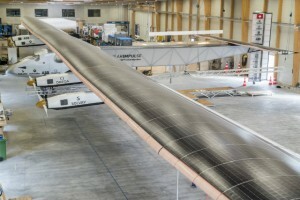 This tour marked the solar powered plane’s first international flights. 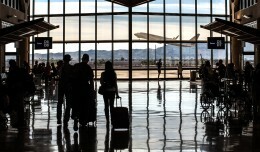 The first intercontinental flight occurred in 2012, with a flight to Morocco, by way of Madrid, Spain. Following that adventure HB-SIA was disassembled, and in early 2013, it was flown to Moffett Federal Airfield outside of San Francisco California. Beginning on May 3rd, the aircraft began its slow journey across the United States. Flying first to Phoenix, AZ, the aircraft then flew to Dallas/Ft. Worth, St. Louis, Cincinnati, Washington DC, and finally New York. 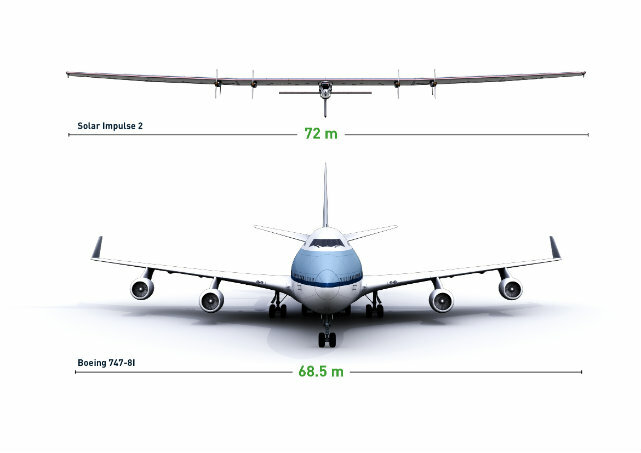 A comparison of the wingspan of Solar Impulse 2 to that of a Boeing 747-8I. Image courtesy of Solar Impulse. 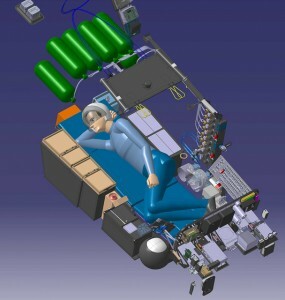 A 3D view of the cockpit layout onboard Solar Impulse 2. Image courtesy of Solar Impulse. One of the key requirements for the new aircraft was an enlarged cockpit. With ocean crossings expected to take 5 days, and only one pilot onboard at any one time, an extremely cramped flight deck was not an option. The original Solar Impulse had a very small cockpit, as the flights were only expected to last a maximum of 24 hours or so. With the expectation of longer flights for Solar Impulse 2, a larger flight deck with a seat that could transform into a lie-flat bed was a must. The cabin has been enlarged to 134 cubic feet, with everything that the pilot might need for 5 days of flying. However, those needs do not include two creature comforts that many of us are used to while flying: the crew compartment will be unpressurized and unheated. With such a strong focus on efficiency, Solar Impulse 2 just could not afford the weight and power requirements of those two systems. Image courtesy of Solar Impulse. While Solar Impulse 2 retains the same basic shape as its predecessor, some changes have been made. The most noticeable changes are to the fuselage Up front, the crew compartment has grown noticeably in both width and height. 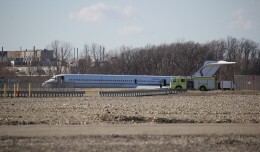 Further back, the long, slender boom leading to the empennage is gone, having been replaced with a more beefy truss-like structure that tapers towards the rear. The entire rear fuselage section is covered with a translucent material that is internally lit with LEDs. 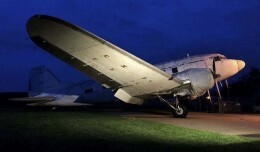 The empennage retains the distinctive cross shape from the original, with large control surfaces to help with low speed flight. Moving to the wings, we see additional changes. The outboard motors have been moved inwards so that they are much closer to the inboard motors. This provides advantages in terms of balancing the thrust that is produced while reducing the overall weight. The wing of Solar Impulse 2 is flat, doing away with the outer portions that were angled upwards on the original. One thing that has been added are retractable outrigger wheels that are mounted to the wings. These are required for stability while the aircraft is on the ground. 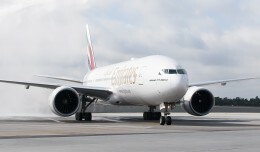 On HB-SIA, members of the ground crew on bicycles would prop up the outboard motors while the aircraft was rolling out, and then the outriggers would be manually installed as soon as the aircraft came to a stop. Solar Impulse 2, the single seater solar airplane with which they will attempt in 2015 the first round-the-world solar flight. Image courtesy of Solar Impulse. 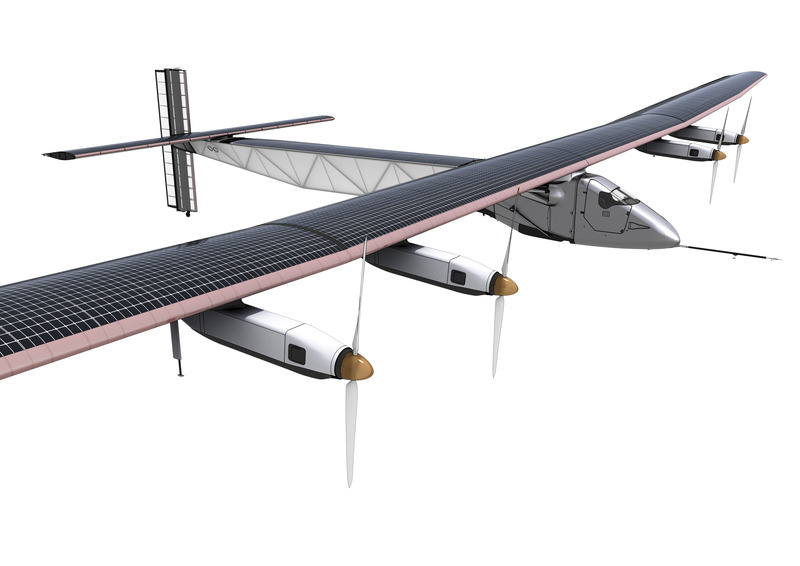 Now that Solar Impulse 2 has been unveiled, the flying can begin. 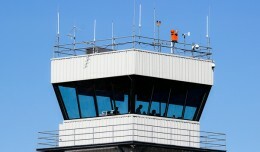 Initial test flights are expected to occur during the month of May. Following the successful completion of those, Piccard and Borschberg will conduct training flights over Switzerland during the summer. Once those have been completed, HB-SIB will be disassembled and shipped to an airport in the Persian Gulf region in preparation for the around the world flight attempt. From there, Solar Impulse 2 will fly across the Arabian Sea to India, followed by stops in Myanmar and China. The first ocean crossing, across the Pacific, will be next, followed by another flight across the United States. Finally, Solar Impulse 2 will fly across the Atlantic Ocean and over either Europe or Northern Africa, before finishing its journey at the same airport that it started from. The around the world journey is expected to begin in March of 2015.